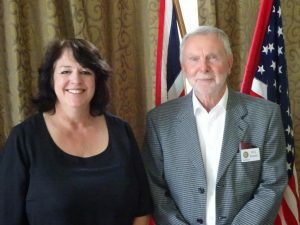 On Tuesday, 10th July, the Club welcomed Sheena Eastwood, the Central Manager of St Vincent’s Support Centre in York Road, Leeds. Sheena gave a detailed and moving presentation about the work being done at St Vincent’s drop-in centre, which exists to help people who are struggling with poverty, deprivation, or immigration issues. All those seeking help are treated on an individual basis to meet specific needs, such as food parcels, counselling and problems arising out of homelessness and debt. Last year there were 1256 cases of individuals seeking immigration support. The object is also to give individuals the skills and confidence to get themselves out of poverty and stay out of it. Apart from a regular staff of 18, the organisation relies on approximately 150 volunteers to help with such issues as fundraising, administration, teaching English, or assisting in the shop and café. St Vincent’s is the President’s chosen local charity for the year and we look forward to supporting them in whatever ways we can.